Back in 1991, a fellow by the name of Eric Chahi created a game called Another World —or Out Of This World, as it was known in North America—and it was spectacular. Its 2D side-scrolling action wasn't remarkable in and of itself, but it was intensely, almost startlingly cinematic; in other words, the sort of thing that lends itself perfectly to the big screen. Project 23 was originally envisioned as a film for Pixel Heaven 2014 , a "retro entertainment" event taking place from May 31 to June 1 in Warsaw, Poland. But as work progressed, the team realized that it had the potential to be something much bigger. With Chahi's support, plus "800 hours of work, months of preparation, five shooting days, weeks of post-production [and] countless hours spent on building movie props and set pieces," they created a four-minute-long video based on the game's famous introduction. As a big fan of the game, I'm happy to say that they absolutely nailed it. It's a little cheesy around the edges and the music is far more blockbuster-bombastic than Jean-Francois Freitas' moody original score, but I can forgive that because virtually everything about it is so wonderfully faithful to the game. Popping the soda can, picking up the alien pistol, even the lead character's bright orange hair—those little touches and more are all here. This is clearly the work of a true fan. And isn't necessarily the end of the project, either. 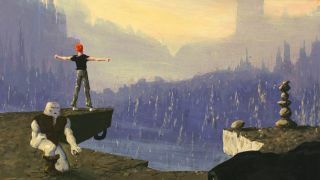 "We have a lot of concept designs for most recognizable parts of 'Another World'," the filmmakers wrote at anotherworld-themovie.com . "They are our foundation for the next step of our world—15+ minutes short film in the 'Another World' universe." A Kickstarter is being considered, and in the meantime supporters are encouraged to "share our short film all over the world." And if you have no idea what I've been talking about, you can dare to compare the Project 23 film with the Amiga version of the original .